What's the first thing about a man in a suit that gets noticed? His shoes? The crease of his pants? Of course not. It's his tie. A man's necktie speaks volumes about him so making sure you make the right statement with your necktie is crucial to making a good first and lasting impression. It's easy to become overwhelmed when you're looking for a tie. But in truth, there are just a few considerations that really come into play and they're easy to remember: size and proportion, appearance (texture, color, pattern), and the tie's ability to complement your suit and dress shirt. Tying the right knot is crucial too, but we'll get to that later. Right now, let's just pick the right necktie. There are lots of textures to choose from, so choosing one that doesn't interfere with the texture of your suit or the pattern of your shirt is important. Silks and blends are the easiest to work with so stick with those for now. In these textures, you can have almost any pattern or color without worrying about them being too busy. Busy detracts, and that's not what you're looking for. A lightweight tie will also come in handy when it's time to choose your knot, so stay in the lightly textured materials for now. There are two schools of thought when it comes to patterns. The first says you can't go wrong with a solid, and that's pretty solid advice. However, says the second school, it's also pretty boring. Yes, patterns can be too busy, but not if you're paying attention to the construction of your suit and the pattern of your shirt. For example, if you're wearing a solid shirt under a pin stripe suit, you'd want to avoid a striped tie that challenges the lines of the suit. A tie with wider stripes than those of the suit is perfectly acceptable. But that doesn't mean an elegant paisley is a bad choice. A hand-sewn paisley or even checked tie can accentuate the lines of the suit while giving a nod to the flair and taste of the wearer. The tie is an accent, not a dominator, and is the first thing people will notice. Ensuring the pattern complements the ensemble is key. You know about the red power tie, and even blue ties are considered strong and professional. When choosing a solid color tie, keep the colors deep and rich. A screaming red is rarely a complement. 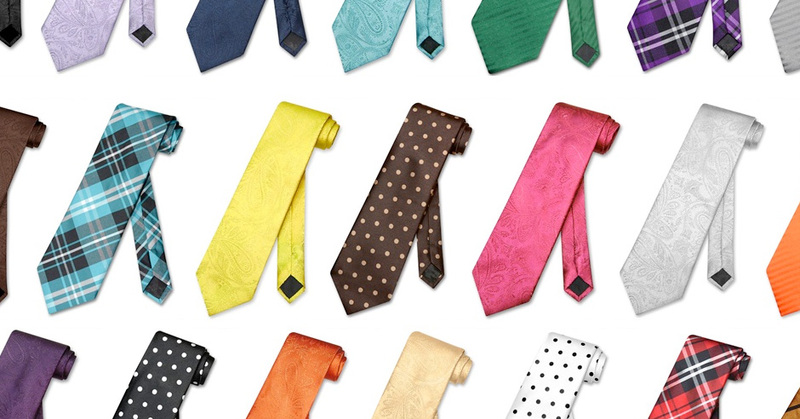 Having several neckties in deep, solid hues will ensure you always have a go-to. That said, there are myriad ways to introduce color into the ensemble without overpowering it. Seasonal colors that match the suit and shirt indicate your attention to your environment. In a less formal setting, teasingly playful colors and patterns can create a casual look. If you hold a tie up to your shirt and have any question as to whether it matches, put the tie away and look for another. Your instincts are probably right, and if you're wearing something you're not confidant about, it will show. Size and proportion are just as valuable in consideration as the appearance of the tie. We're talking about you here, as well as the tie. A tall, slender man will look ridiculous in a short, wide tie. At the same time, a broad shouldered man will look underdressed in a slender or skinny tie. Regardless of your build, the length of your tie should always be the same. It should end in the center of your belt buckle. Knowing how to choose a tie by its length is important, and fairly easy to calculate. Add your height in inches to your collar size. If the number is less than 90 inches, a standard size tie is probably right for you. If the number is greater than 90, try on an extra-long tie, knot it up, and see if it hits your buckle. If you're a tie bar kind of guy, make sure you're wearing it correctly. A tie bar is intended to hold both ends of the tie securely to each other and the placket front of the shirt. The tie bar should be as understated as possible and should never be longer than the width of the tie. Pretty simple really. Choose simple textures, keep a few solids handy, always have some patterns available, make sure the construction complements the size of the wearer, and above all, be comfortable in your choice. Your confidence in your appearance will give everyone else confidence in you.